Good afternoon! Today, the Red Bulls are back in MLS action against the New England Revolution up at Gillette Stadium. To say that the New England away game hasn't been fruitful for the Red Bulls would be a massive understatement. 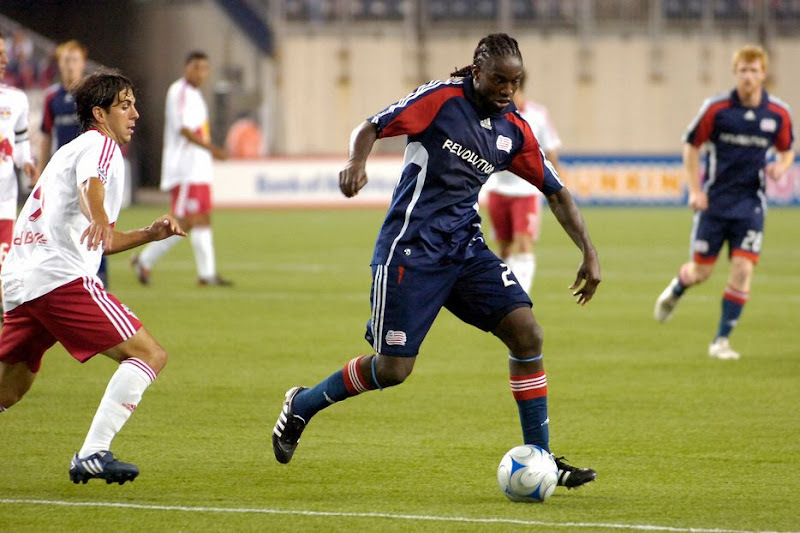 In fact, the last time the Red Bulls won away against New England was... Well, they've actually never won a game up there, as the last time they took all three points they were known as The MetroStars. The Red Buls and Revs have already met this season (earlier this month @Red Bull Arena) in a US Open Cup qualifier. The Red Bull handily won 3-0 but the Revs fielded 2nd and third stringers for that one. You can bet that it will be their full first team on the field for this one. Unfortunately, this will mean that Red Bulls killer (and newly admitted pothead) Shalrie Joseph (pictured above), who checked himself out of rehab earlier than Red Bulls fans would have liked, will be on the field. The Red Bulls, coming of a nightmare MLS loss against Columbus (their third consecutive MLS loss, in fact) will be looking to shut Joseph down and break that Gillette Stadium winless streak. With all that in mind, let's get to some predictions. For the second year in a row I will be traveling up to this game. Last year this fixture turned out to be a 4-0 horror show in favor of the Revs. We were forced to park about a mile from Gillette, frog marched into the stadium then penned up like animals behind bicycle barriers. In the end we got absolutely manhandled by Taylor Twellman, Shalrie Joseph and company and we all went home miserable, especially those poor fans who got pepper sprayed by the overly aggressive security guys in Foxboro then had to endure the bus ride from hell back home. All of this begs the question, “Why am I returning?” Well, for one thing this team needs our support given that a large number of Red Bull fans have chosen instead to travel to Philadelphia to see the USMNT play Turkey. Coming off three successive losses and with a horrible record at Bob Kraft’s Pleasure Palace in the Middle of F'ng Nowhere, we will be up against it again, especially now that Red Bull killer Joseph is back from the Cheech & Chong tour and back in the starting lineup. Once again the Revs have decided to quarantine all 10-20 of us behind the goal. Hopefully we wil, not see a repeat of last season’s security tactics. In any case, we are coming off the high of two successive wins. Our first team is pretty well rested and our bench looks deeper than any time in recent memory. We will finally prevail in the wilds of Southern New England, by a score of 2-1. Juan Pablo Angel will notch another goal. I also like little Irving Garcia to come on in the second half and torch the New England back line. Hans Backe’s Viking Army will emerge victorious from the field of battle because they must! Looking to snap a 3-game losing streak, we head to the Kraftwerk, Gillette Stadium, where we are 4-16-4 to play the Revs, against whom we have a 13-game winless streak. Shalrie Joseph returns today from his stint in rehab. We have 8 players on the injury report, with our central midfield still in disarray. Chris Albright has been declared a no-go because the Red Bulls don't want to test his knee on the turf in Foxboro. We also have managed only one goal in the last three league matches, while our central defense--a hallmark of the early season, has been letting us down of late. The cards may be stacked against us today. Yet, this is a season of breaking lots of streaks that have been weighing down the team: our road-winless streak, and our conference road winless streak as well. Joseph will hopefully not be sharp. Plus, the Revs just aren't very good this season. It will be time for some of the Baby Bulls to step up and prove they can play in league matches today if we are going to come away with anything. While I will (of course!) be rooting for the win, I'll be happy with a draw and that is my prediction. Our defense will regroup and tighten up, but until we manage to score more than one in a league match again, I can't predict that we'll score more than that. A 1-1 draw. Tchani. While my loyalty to Uncle Deitirch and Mr Backe prevents me from predicting a loss, I do not have a good feeling about this one. Crown Heights spliff head, and Red Bull murderer Shalrie Joseph is back from his "weed" suspension. No matter how high he gets or whatever stiffs they have on the team, he has a habit off killing us. The game is on synthetic turf. JPA is sure to come out before half time with a back injury. Our best hope is for some of our cup heroes to come through. Hopefully Mr. Backe, in his infallible wisdom, sees fit to use Irving Garcia and Toni Tchani. Both look ready for front line combat! My prediction: stalemate. 1-1.